← Random Panel: Why we don't have live "First Date Commentators"
I've always assumed his name was supposed to be read all in one, as if his name were "Jack" but had "Ninja" appended to it, like a shortening of "Ninja Jack". But now I am forced to wonder if perhaps there was a whole line of these guys a la James Bond and the Double-O series. Like this fellow is eleventh in a series of Ninjas, just after Ninjaj and Ninjai, but before the inevitable rise of Ninjal. Regardless, I think Valiant was really onto something with this naming deal, and I eagerly await the appearance of female sidekick "Ninjill". Since you don't have to be in line of sight, you can be anywhere within 700 meters, we're told, and still get your man. Through the magic of Google Calculator, I was able to determine that 700 meters is almost half a mile. 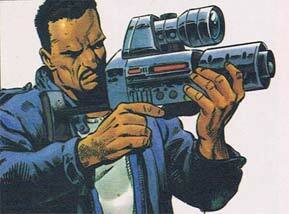 As a result, the dread Djinn fires his weapon not from nearby Short Term Parking, but from ... a bathroom. Apparently smart bullets can open doors, they're very polite that way. 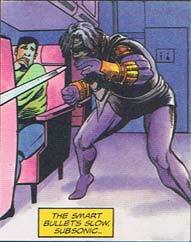 If you can get past that particular bit of lunacy, you won't have a problem believing that Ninjak spots the disguised Djinn and follows him onto a plane, which still has taken off on time despite an assassination in the terminal. Sure, they delay my flight for an hour because it's raining in Kuala Lampur, but off a UN diplomat down the hall and everything's hunky-dory. In fact it's so slow and so maneuverable that it manages to turn around -- twice! -- in the narrow confines of an airplane aisle. Now that's some agile bulleteering, my friends! Apparently, though, like so many youths in the Nineties the smart bullet is addicted to video games, because Ninjak is able to trick it by waving a Gameboy under its metal nose and tossing the device out the door. No, really. I'm not surprised the Weaponeers were brought down if their best tech can be defeated by Super Mario Kart. Luckily everything's brought to a satisfactorily bloody conclusion, with a plane full of dead bodies in the sky and a decapitated Djinn used as a flotation device for our "hero". 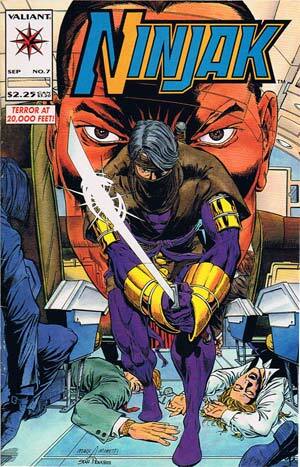 My only beef with this issue, besides the completely nonsensical parts between the covers and the wanton bloodshed and the name of the character and the inane physics of the smart gun, is that the cover shows Ninjak with a sword while in the comic he's without his weapons, presumably because even in the go-go Nineties you couldn't pack a blade in your carry-on luggage. Of course no one had a problem with him boarding with metal armor and a kevlar vest, or with Djinn packing in a parachute, smart gun, and high explosives, but then, you can't expect airport security to catch everything. This entry was posted in Retroviews. Bookmark the permalink. My theory is that the more writers and/or artists a book has, the crappier it is going to be. There’s a definite “too many cooks” thing going on there! 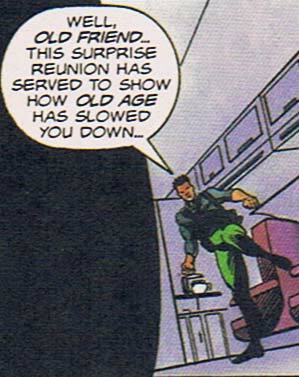 So, the guy says, “old age has slowed YOU down”? But he’s the one who has to lift his leg to pee and and doesn’t have the energy to undo his pants first.